So many people are happy to close the door on 2016 and declaring it one of the worst years ever. Undoubtedly there have been some horrific things that have happened over the past year. People are dismayed over the results of the presidential election. Celebrities - musicians, actors and Hollywood entertainment legends seem to be dropping like crazy. There's been a lot of sadness this past year. However, while still acknowledging the unfortunate events of 2016, there were beautiful, inspirational positive things that happened as well. There were things that made me incredibly happy. Things that made me beam. Things that made 2016 an amazing year for me personally. My husband and I celebrated 25 years of marriage!!! The food blog my sister and I started continues to grow and turned 5 this year! And the most memorable event and the thing that really made this an awesome year was the Cubs' World Series win. 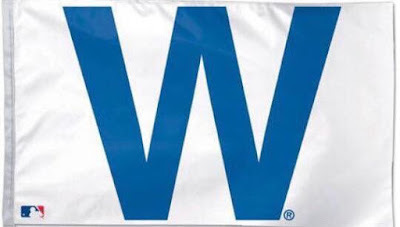 You have to be a die-hard Cubs fan to understand the significance of this one. For my entire life and so many other Cubs fans, we've ended every season saying "Next year will be the year." It is just so unbelievable that this really, finally was the year. And I still have to pinch myself sometimes. When I became a mom, you can bet I exposed them to my love of the Cubs and took them to many baseball games. My sister is a season ticket holder and for several years, each kid has received a set of tickets as a birthday/Christmas gift. I cherish those time spent taking them to games - even when they were too little to sit through a full game or more interested in the peanuts and cotton candy than what happened on the field. Of five boys, my oldest is the only one who followed along in being a hard-core, die-hard fan. He's been to several Cubs conventions and has many autographs he obtained directly from players while waiting outside the locker room or the player's parking lot or at Cubs events. So, my oldest son, my dad and I share this big, big love of the team. This year is the year we had been waiting and waiting for. Many times in recent years my dad has said, "All I want before I die is to see the Cubs win the World Series." It was so significant and heartwarming and emotional for it to finally happen and for him - at age 80 - to be able to see it. 2016 may have been a bad year for others, but has been one of my best by far.